Last Thursday evening I took my seat in the TSB Space at Tūranga for the first WORD Christchurch event of the year. Stirring rock music played, and the projector announced speaker Adrian Hayes, complete with logo overlaying an aspirational image of earth from space. The atmosphere had a kind of uplifting, hopeful tone, befitting Hayes’s interest in personal and business development, a career which he maintains alongside his expeditions and adventures. When the man himself took the stage he spoke with a great deal of energy, of the kind which I imagine is essential to pursuing a life of extreme adventure, as Hayes has. Adrian Hayes had come to Christchurch to speak having just released a new book One Man's Climb: A Journey of Trauma, Tragedy and Triumph on K2 detailing his experiences attempting, and ultimately succeeding, in climbing the infamously dangerous 8000m peak K2. Having always harboured a youthful thirst for travel and adventure he left school relatively young to join the army, with the goal of joining the SAS. He was for some time a British Army Gurkah officer, and learned to speak Nepalese and Arabic. After some time in the army, the romanticism of adventure wore thin with the realisation that higher roles would be restricted to paper-pushing. Hayes left and completed an MBA, going on to develop a career as a team and executive coach/consultant. Completed polar journeys, across Antarctica and the Artic, trekking and kite-skiing. He mentioned that the North Pole was the hardest thing he’s ever done. Crossed the Arabian desert on camels. Climbed Everest (using Viagra as antidote to altitude sickness). All of this occurred prior to him deciding to climb the notorious K2, in the midst of great personal upheaval, as he fought for access to his children through the family courts. The highest altitude humans appear able to exist at on a permanent basis is 5300m, as evidenced by the town Rinconada in Peru. On the summit of any of the 8000m peaks, such as K2 and Everest, humans cannot survive more than a few days, and the effects of altitude take their toll as climbers attempt to scale high mountains. K2 has an appalling death rate; 1 in 4 climbers die, the weather in the Karakorum is worse than it is at Everest, and climbers must be really good – the route involves technical ice climbing and rock climbing. It is, therefore, to quote Hayes, a “momentous challenge” and “damn risky”. 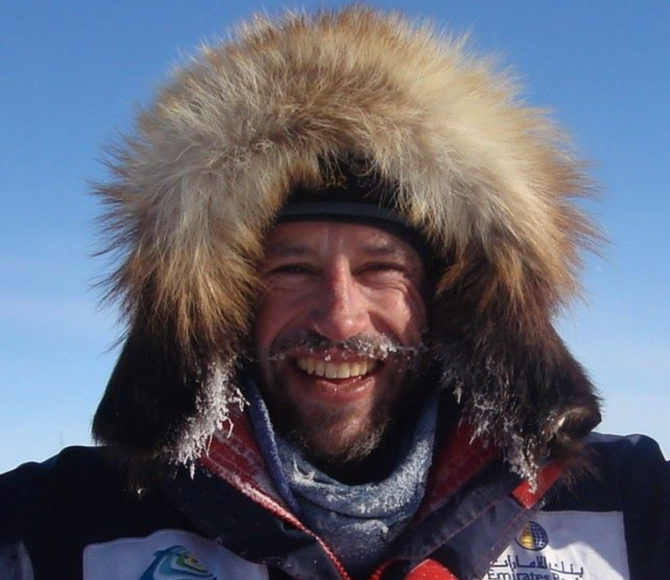 Yet in spite of these risks and challenges, Adrian Hayes decided in 2013 to climb it. For him, in the face of a personal crisis, taking on a physically demanding expedition like K2 served as a way of coping – burying oneself in a seemingly impossible quest as means of avoiding confrontation with emotional pain. And bury himself he did, undertaking a gruelling training regime which consisted runs up Dubai skyscrapers and the dunes and mountains of Oman and the United Arab Emirates. He teamed up with a man named Al Hancock, and together they headed for K2, resolving to persist even after an attack on a climbing expedition on Nanga Parbat by the Taliban deterred others that year. The 2013 expedition hit problems. The weather was terrible, and it was this that ultimately spelled the demise of Hayes’s effort. Most climbers on the mountain descended while waiting for a weather window in which to summit, however two climbers on the mountain - well-known New Zealand climber Marty Schmidt and his son Denali - continued. Tragically, the two were killed in an avalanche, and Hayes returned to the UK grieving, but resolved to return the next year. 2014 saw the best weather in the Karakoram in years, and Hayes was successful in summiting K2. Lessons he gleaned from his time in the mountains came through in his talk accompanied by quotes he found inspiring displayed on the projector – ‘courage is not the absence of fear, rather the willingness to face it’, ‘The mountains will always be there, the trick is to make sure you are too’ - but I would have been interested to hear more around this. He went on to speak about what motivates people to climb mountains, mentioning internal motivations like self-development, the pursuit of meaning, purpose, and goals. He also talked of external motivators, like recognition, respect, fame, and tied in to this the role of social media in fuelling narcissism and the pursuit of “bucket list” ticking. Some of his disparagement of these external motivators felt slightly contradictory to me, given that he had casually dropped in his own Guinness World Records earlier in the talk. Nevertheless, Hayes has completed some really impressive feats of human physical endurance and persistence, and his new book is bound to be an interesting read, with deeper insights into the challenges and lessons he has faced in the pursuit of extreme adventure. If Hayes's story sparks a yearning in you for more high altitude epics, or cool tips for your own missions, below are some resources available through your library! Adrian Hayes' biography on WORD Christchurch's website.